Snowmobiling is not simply a recreational activity but for some people in certain geographic locations, it can be their only means of transport over certain months of the year. Nevertheless, the use of snowmobiles continues to generate much debate over its environmental impact and there are conflicting sides to the argument. Those who say that snowmobiling has a detrimental effect upon the environment will often point to issues such as the damage it causes to wildlife, vegetation and air quality. Those who are against snowmobiling will point to the fact that the speed and movement of snowmobiles causes a good deal of stress and harassment to wildlife, causing disruption in movement patterns which, in turn, makes it harder for animals to find adequate food supplies. Opponents will argue that this then results in increased mortality in locations where snowmobiles are being used over those areas where the same species are left relatively undisturbed. Critics of snowmobiling will also point to the damage that snowmobiles do to vegetation with roots being crushed and soil erosion occurring as well as the problems created by snow compaction which can particularly effect the ability of small mammals to dig out adequate food for the winter months. Although snowmobiling, like any other form of motorised transportation, has evolved over recent years with the design of more efficient engines, critics will point out that snowmobiles still create air pollution and will point to not only wildlife being affected by their carbon emissions but the human population too. Apart from those who have to rely on a snowmobile to go about their day-to-day lives over the winter months in some remote locations, there are many other supporters of snowmobiling who will cite the fact that, compared to cars and other road vehicles, the actual geographic scale of where snowmobiles operate is minute compared to the environmental impact caused by road users. They’ll also point to the fact, unlike road vehicles, snowmobiles are often only used for approximately 3 months each year. Then there are the latest engine designs which emit less carbon emissions into the atmosphere than some road vehicles as well as improvements in the reduction of the noise snowmobiles make compared to the models that were used over a decade ago. 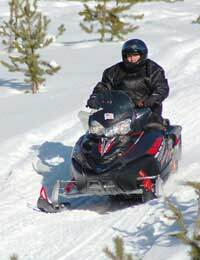 Supporters of snowmobiling will also say that even those who use snowmobiles for recreational purposes are, for the most part, just as committed to protecting the environment themselves, given that one of their chosen activity’s main attractions is having the opportunity to get out there in the snow and experience the sights and sounds of nature and the wilderness themselves. Therefore, they’ll argue that they are good at policing themselves when it comes to the protection of the environment so that it can be enjoyed by generations of snowmobilers to come. It is a debate that is bound to continue. And, whilst there can be no doubt that the environment would be better off if fewer people used a snowmobile, the extent of the damage caused by them still needs to be researched more thoroughly. In the meantime, all that can be hoped for is that those who use snowmobiles, whether it is out of necessity or for pleasure, as well as those who manufacture them maintain a positive approach towards their environmental impact and place conservation issues at the very heart of what they do.